I have a little time this morning to "re-plug" in some of my favorite Etsy sellers into my new store page. That's the one thing about having all my goods in one spot for so many months. 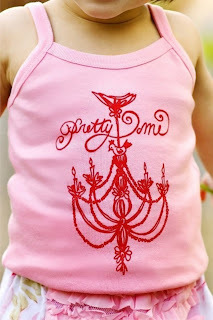 If you have a little girl you must check out Pretty Me. I bought my daughter an apron skirt earlier this year and it's been on of my favorite finds. The craftsmanship is excellent and the fabric she pulls together to make each item is meant to be. I'm so glad I started to browse on her store again because I saw this cutest little tank. After reading further about it the designer of this adorable graphic, Cathy is hosting a giveaway of it. Go here for your chance to win one.